This comfortable sofa makes a great focal point for your living room with a casual style that looks great from any angle. 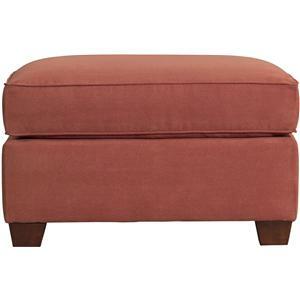 The rolled back detail on the cushioned back adds a sophisticated dimension to the style. Low profile rolled arms create a simple look with a down-home, cottage appeal. 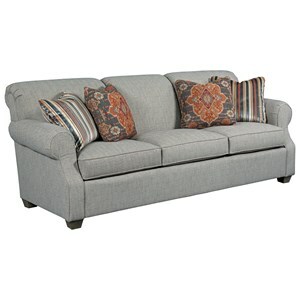 Welt cord trim and tapered wood feet add a finished look to this sofa. 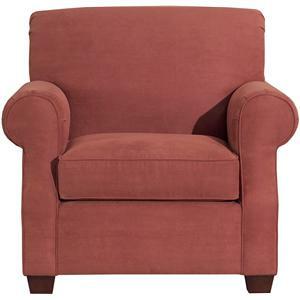 Five, plushly furnished, Blend Down seat cushions offer a pleasing and comfortable seat for your whole family. 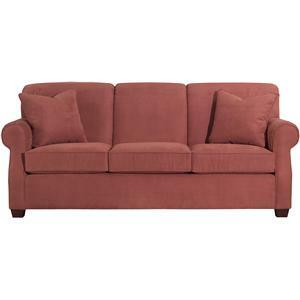 The Lynchburg Four Piece Sectional Sofa by Kincaid Furniture at Hudson's Furniture in the Tampa, St Petersburg, Orlando, Ormond Beach & Sarasota Florida area. Product availability may vary. Contact us for the most current availability on this product. 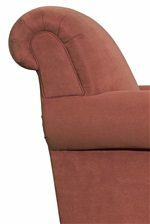 814-37 Armless Chair 1 24" 40" 37"
814-32 RAF Loveseat 1 56" 40" 37"
814-31 Laf Loveseat 1 56" 40" 37"
814-34 Quarter Round 1 70" 42" 37"
Fabric Options Over 1,000 designer fabrics available by special order. Leg or Skirt Tapered wood legs are made from solid hardwood. Seat Support Sinuous Spring standard, Eight Way Hand-Tied optional. Furniture that contains springs has “S’ shaped springs tied together with steel wire to ensure a consistent seating platform. Padding & Ergonomics Densified batting covers all spring under sateen. 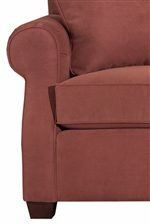 Deep cushioned back lends extra comfort. The channeled design provides shape retention. The Lynchburg collection is a great option if you are looking for Casual furniture in the Tampa, St Petersburg, Orlando, Ormond Beach & Sarasota Florida area. Browse other items in the Lynchburg collection from Hudson's Furniture in the Tampa, St Petersburg, Orlando, Ormond Beach & Sarasota Florida area.